This cemetery, 28 acres in extent, was constructed on the site of a temporary cemetery established shortly after the area was liberated on 2 August 1944 by the U.S. 8th Infantry Division. After the war, the remains of American military Dead whose next of kin had elected interment on foreign soil were moved from temporary cemeteries to this, one of fourteen permanent sites. 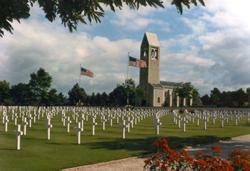 The use of the land was granted to the United States government in perpetuity by the peoples of France in recognition for the sacrifices in liberating Europe. Most of the interred died in the Breakout of Avranches, the fierce fighting in Saint-Lô and Mortain, and the liberation of Brittany. The memorial chapel, of La Pyrie granite, from Le Hinglé in Brittany, consists of an antechamber and tower, museum room and chapel. At the East end is a sculpture group, in Chauvigny limestone, "Youth Triumphing Over Evil". Over the entrance door is another sculpture group consisting of an eagle, shield, stars, laurel and arrows representing the Great Seal of the United States. Below the sculpture is the inscription : "IN MEMORY OF THE VALOR AND THE SACRIFICES WHICH CONSECRATE THIS SOIL". Inside, the antechamber contains a small room with a stained glass figure of St. James of Compostela. Here also one sees the dedicatory inscription in French and English of which the English version reads : "1941 - 1945 * IN PROUD REMEMBRANCE OF THE ACHIEVEMENTS OF HER SONS AND IN HUMBLE TRIBUTE TO THEIR SACRIFICES THIS MEMORIAL HAS BEEN ERECTED BY THE UNITED STATES OF AMERICA". The museum room, just beyond the antechamber, displays the flags, projectiong from high. On the wall flanking the entrance doorway to the South is engraved an extract from President Franklin D. Roosvelt's prayer on the occasion of the invasion of Normandy. D-Day 1944. The chapel is at the East end of the museum, separated by a low granite divider and wrought iron gates. The face of the granite divider bears this inscription : "O LORD SUPPORT US ALL THE DAY LONG UNTIL THE SHADOWS LENGHTEN AND OUR WORK IS DONE * THEN IN THY MERCY GRANT US A SAFE LODGING AND PEACE AT THE LAST". The tablets of the missing, emanating from the gently curved walls of the terrace are inscribed the name, rank, organization, and State of 498 of our Missing. They gave their lives in the service of their country but their remains were either never recovered or if recovered not positively identified. One, later recovered, is denoted by a bronze rosette. On the walls below the flagstaffs is the inscription together with the French translation : "HERE ARE RECORDED THE NAMES OF AMERICANS WHO GAVE THEIR LIVES IN THE SERVICE OF THEIR COUNTRY AND WHO SLEEP IN UNKNOWN GRAVES 1941 - 1945". These inscription panels are of Beaumont stone from southwestern France. 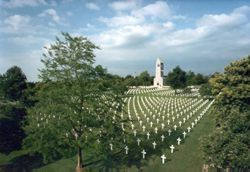 The graves area contains the remains of 4,410 American military Dead who lost their lives in the area of North western France. They represent 43 percent of the burials originally made in the region. Their 4,408 headstones are set in 16 fanshaped plots, curving from the central mall. These Dead, who gave their lives in our country's service came from every State in the Union, the District of Columbia, Hawaii, and Alaska as well as Canada. Ninety five of the headstones mark the graves of "Unknowns", whose remains could not be positively identified. Two of these graves contain the remains of two Unknowns who could not be separated. Here also, in twenty instances, two brothers rest side by side. At the far West end of the mall is a rectangular stone cenotaph of La Pyrie granite. Carved upon it in bas relief are a torch and laurel wreath and the words "PRO PATRIA 1941 - 1945". The architect for the cemetery and its memorial was William T. Aldrich of Boston, Massachusetts. The landscape architects were Shurcliff and Shurcliff, also of Boston. The sculpture group "Youth Triumphing over Evil" as well as the group over the memorial entrance door were designed by Lee Lawrie of Easton, Maryland. The cemetery was dedicated during a ceremony on 20 July 1956.